– Ensure that users can connect to the portal by using the same URL from any location. – Ensure that users can access corporate information from outside the network without using a VPN connection. – Allow users to configure notifications for content changes. – Allow users to follow content creators. – Limit the number of sites and people each user can follow to 100. – Allow content authors to upload documents, large image files, and large video files for consumption by internal and external users. – Allow administrators to promote search query results across the entire company. – Utilize My Sites to share content. – Provide opportunities for social interaction. – Do not exceed the minimum hardware specifications. – Install the minimum supported versions of all software on the servers. – Control the growth of storage utilization. – Maximize existing content database usage before creating new content databases. – Store large files on network attached storage (NAS). – Ensure that all web applications, site collections, files, databases, and components stay within the supported limits. 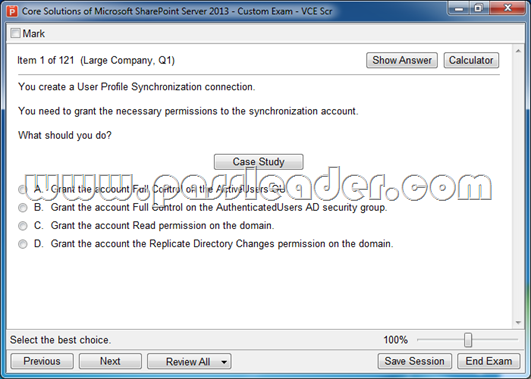 – Configure the User Profile Synchronization service to import user profile data from Active Directory. – Grant the User Profile service account the least permissions necessary to read data. – Ensure that current and future SharePoint environments include the most recent software updates. – Use predefined database naming conventions. – Create individual user sites by using the https://contoso.com/personal/path. You create a User Profile Synchronization connection. You need to grant the necessary permissions to the synchronization account. What should you do? A. Grant the account Full Control on the ActiveUsers OU. B. Grant the account Full Control on the AuthenticatedUsers AD security group. C. Grant the account Read permission on the domain. D. Grant the account the Replicate Directory Changes permission on the domain. You need to ensure that content authors can publish the specified files. What should you do? A. Create multiple authoring site collections. Create a site that contains lists, document libraries, and a Pages library. Create an asset library in a new site collection, and enable anonymous access to the library on the publishing web application. B. Create multiple authoring site collections. Create an asset library in the authoring site collection, and enable anonymous access to the library on the authoring web application. C. Create one authoring site collection. Create a site that contains multiple lists, document libraries, and Pages libraries. D. Create multiple authoring site collections. A. Define a mapping for the thumbnailPhoto attribute of the Picture user profile property. B. Run the Update-SPUserSolution Windows PowerShell cmdlet. C. Run an incremental synchronization of the User Profile Synchronization service. D. Run a full synchronization of the User Profile Synchronization service. E. Run the Update-SPProfilePhotoStore Windows PowerShell cmdlet. F. Define a mapping for the photo attribute of the Picture user profile property. You copy the content of the SharePoint installation media and software updates to your hard drive. You need to meet the setup requirements for future SharePoint server installations. What should you do? A. Extract the content of each file to the Updates folder by running the /extract:<path> command. B. Upgrade the installation media by running the /lang:<lcid> command. C. Extract the content of each file to the Setup folder by running the /extract:<path> command. D. Extract the content of each file to the PrerequisiteInstallerFiles folder by running the / extract:<path> command. A. For the Remote BLOB Storage (RBS) storage subsystem on network attached storage (NAS), limit the maximum time-to-first-byte (TTFB) of any response from the NAS to 100 milliseconds. B. Limit the maximum size of each content database to 4 TB. C. For the Remote BLOB Storage (RBS) storage subsystem on network attached storage (NAS), limit the maximum time-to-first-byte (TTFB) of any response from the NAS to 20 milliseconds. D. Limit the number of documents in each document library to 20 million. E. Limit the number of documents in each content database to 10 million. F. Limit the maximum size of each content database to 200 GB. You need to ensure that service applications meet the technical requirements by using the least amount of administrative effort. What should you do? A. Use the Farm Configuration Wizard to add service applications. B. Use Windows PowerShell to configure service applications. 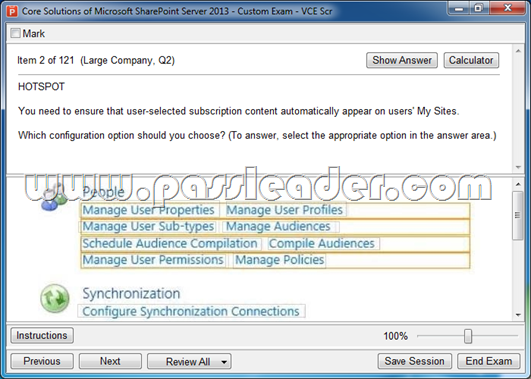 C. Use the SharePoint Products Configuration Wizard to complete the server configuration. 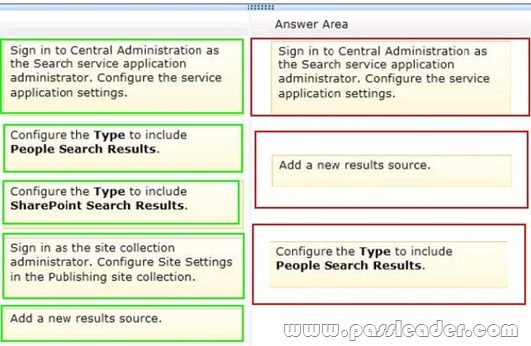 D. In Central Administration, manually create each service application. You are a SharePoint administrator for an online photo-processing company named Contoso, Ltd. Contoso’s primary customers are professional photographers. 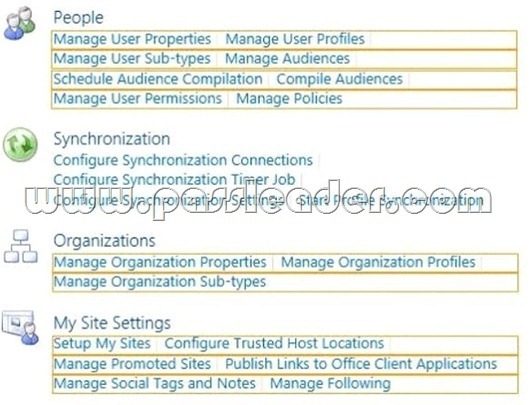 The Contoso SharePoint 2013 environment includes the sites described in the following table. The intranet site includes a document library for each employee in which the employee stores photos. The SharePoint environment contains five front-end web servers that use Windows Network Load Balancing (NLB) with NLB affinity set to None. The company maintains all processed photos in the SharePoint content database. The content database uses RAID 5 storage. Photo files that are more than one year old are rarely viewed. Employees actively use the default self-service site creation feature. The network infrastructure contains an Active Directory Domain Services (AD DS) environment. All servers run Windows Server 2008 R2. The internal AD DS domain is named contoso.com. Active Directory Federation Services (AD FS) is deployed in the LAN. Two AD FS proxy servers are deployed in the perimeter network. Users log on to client computers by using the syntax username@contoso.com. Contoso has a lab environment that includes a dedicated AD DS environment and SharePoint 2013. The main lab SharePoint site is located at lab.intranet.contoso.com. A test site for a project named Project2 exists under lab.intranet.contoso.com/corp. The default self-service site creation feature is enabled for the test site. Contoso has a development team that maintains the public website, maintains the intranet site, and creates SharePoint apps. The development team recently created a SharePoint- hosted app named Appl that converts .tif files to .png files. Contoso is forming a new corporation named Proseware, Inc. that will sell SharePoint apps. The company has acquired the proseware.com domain name. Contoso is preparing to federate with Microsoft Office 365 and will use the proseware.com domain for Office 365 services. – App1 must have access to each employee’s photo document library. – App1 must use Windows Authentication. – Each front-end web server must use a single IP address for all SharePoint sites and apps on that server. 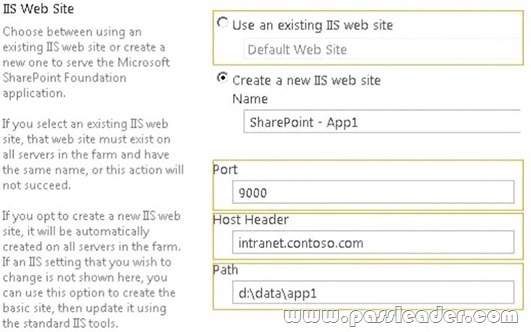 – All SharePoint sites and apps must listen on port 9000. – Office 365 must use single sign-on (SSO). – Monitor whether a large number of documents are checked out. – Monitor whether a large number of unpublished items are being requested. – Monitor changes to a value in a specific registry key. 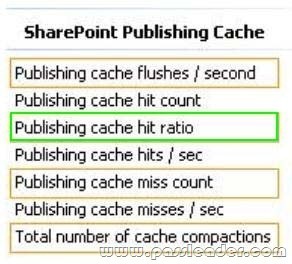 – Monitor the SharePoint cache hit ratios. – Perform monitoring only from 9:00 A.M. to 3:00 P.M. daily. 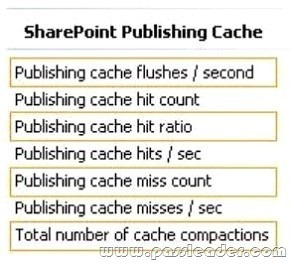 – SharePoint is not performing as well as it was when the content database was smaller. – Storage costs to house the photo files are too expensive. – Scanned contracts are stored in binary large object (BLOB) cache storage. The BLOB cache is routinely filling up. End users are reporting poor performance when viewing scanned contracts. You need to create a new site collection while maintaining the ability for users to create their own sites. What should you do? A. Use a path-based site collection and a single farm that contains all the web applications. B. Create a host-named site collection and use a single farm that contains all the web applications. C. Use a path-based site collection and alternate access mappings. D. Create a host-named site collection and use a single farm that contains a single consolidated web application. A. Create a user-defined data collector set. B. Monitor only startup event trace sessions. C. Monitor only event trace sessions. D. Use a system-defined data collector set. You need to configure a managed path to support Project2. What should you do? A. Use an explicit inclusion for /corp. B. 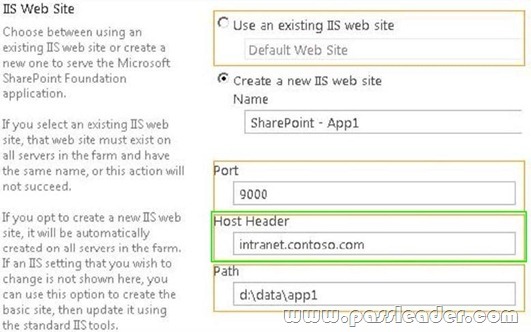 Create a new IIS virtual directory under the /corp site. C. Create a new IIS virtual directory under the default website. D. Use a wildcard inclusion for /corp. You need to implement Office 365 authentication. What should you do? A. Add only adatum.com as an Office 365 SSO domain and use the SupportMultipleDomain parameter. B. Create an AD DS domain named proseware.com and join the AD FS servers to the proseware.com domain. C. Add adatum.com and proseware.com as Office 365 SSO domains and use the SupportMultipleDomain parameter. D. Add only proseware.com as an Office 365 SSO domain and use the SupportMultipleDomain parameter. You need to select the appropriate authentication method for App1. What should you do? A. Use classic mode authentication and set the authentication type to NTLM. B. Use classic mode authentication and set the authentication type to Kerberos. C. Use the SharePotnt server-to-server security token service (STS). D. Use the Open Authorization 2.0 (OAuth 2.0) web authorization protocol. A. Create an AD DS domain named proseware.com and join the AD FS servers to the proseware.com domain. B. Add a DNS CNAME record for www.proseware.com and point it to www.adatum.com. C. Deploy an AD FS proxy for the proseware.com domain. D. Add proseware.com as an Office 365 SSO domain and update all user principal names (UPNs) to also use proseware.com. A. Use classic mode authentication and set the authentication type to Kerberos. B. Deploy the Secure Store Service. C. Use the Open Authorization 2.0 (OAuth 2.0) web authorization protocol. D. Use the Distributed Cache service. D. Add adatum.com and proseware.com as Office 365 SSO domains and use the SupportMultipleDomain parameter. C. Set the NLB client affinity to Single. D. Remove the Network Load Balancing feature from all of the servers. A. Remove the Network Load Balancing feature from all of the servers. B. Set the NLB client affinity to Single. C. Deploy the Secure Store Service. D. Use classic mode authentication and set the authentication type to NTLM. You are the SharePoint administrator for Blue Yonder Airlines. The company currently has a SharePoint 2010 environment. It is your responsibility to install and configure a SharePoint 2013 environment that will be used for information management and collaboration, both internally and with external partners. You must also migrate the existing SharePoint environment to SharePoint 2013. Blue Yonder works with several external partners, including those described in the following table. All existing servers run Windows Server 2008 R2. The network infrastructure contains an Active Directory Domain Services (AD DS) environment. The internal AD DS domain is named blueyonderairlines.com. User-specific contact information is stored and managed in AD DS. All employees are located in the ActiveUsers organizational unit (OU). Active Directory Federation Services (AD FS) is deployed in the LAN. Two AD FS proxy servers are deployed in the perimeter network. Users log on to client computers by using the syntax username@blueyonderairlines.com. Blue Yonder provides access to the SharePoint environment to partners through individual URLs for each partner company. Each partner company has a dedicated web application and site collection. The following table describes the access URLs. In preparation for the upgrade you maximize the default upload limits for each web application. Blue Yonder has an existing managed metadata service containing managed metadata and content types. The content types have workflows. You create a new managed metadata service connection for the Wingtip Toys web application. A workflow created by Blue Yonder moves information through the product lifecycle. Each access URL specifies a separate web application, site collection, and site. – Provide an environment where toy design, manufacturing, and sales information can be shared between Blue Yonder and partner companies. – Provide a training site for internal and external users. – Allow content authors of training materials to upload documents, large image files, and large video files for consumption by internal and external users. – Allow users to sort content by category. – Ensure that users from Wingtip Toys or Tailspin Toys can access content only in their own areas of the portal. – Prevent users from Wingtip Toys and Tailspin Toys from adding terms or creating enterprise keywords. – Content types and keywords must be shared between sites, site collections, and web applications. – Simplify search processes by collecting unique characteristics and information about each uploaded item. – Allow administrators to promote search query results across the entire environment. – Allow resource coordinators from Blue Yonder to find temporary staffing options from Margie’s Travel contractors and employees. – Provide opportunities for social interaction between employees, contractors, and external contacts to promote idea generation and socialization. – Utilize site feeds on all collaborative sites. – Replicate profile information in the https://blueyonderairlines.com site to partner sites. – Store all large files outside of the SharePoint content database or databases. – All servers must run on virtual machines. – Ensure that search queries are handled by web servers. – Ensure that all lists support multiple content types. A. Enable the Site Feeds feature on each My Site. B. Enable the Following Content feature on each team site. C. Enable self-service site creation on the web application that contains the team sites. D. Enable the Site Feeds feature on each team site. A. Grant the Read and Restricted Write Access to Term Store permission to the Wingtip Toys and Tailspin Toys application pool accounts. B. Grant the Full Access to Term Store permission to the Blue Yonder application pool account. C. Add the managed metadata service connection to the application proxy group that is assigned to all three web applications. D. Grant the Read Access to Term Store permission to the Local Farm account. E. Grant the Read and Restricted Write Access to Term Store permission to the Local Farm account.